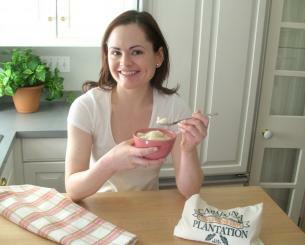 Since she is from South Carolina, cooking grits seemed the obvious choice! 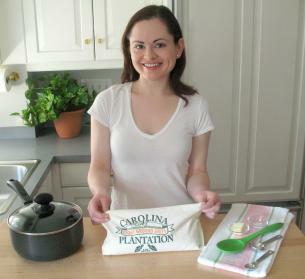 My post today will focus on “how to make grits”, not “the use of prepositions” – for that, you’ll have to ask Fiona! 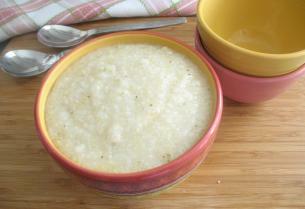 Grits are a grain made from ground corn or “hominy.” When cooked, they have a porridge-like consistency. They are a common food in the Southern portion of the United States. 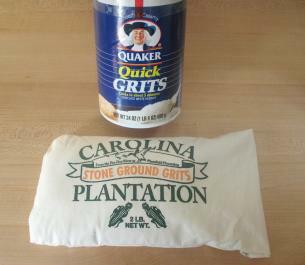 Depending on how they are prepared, grits can be eaten as part of breakfast, lunch or dinner. 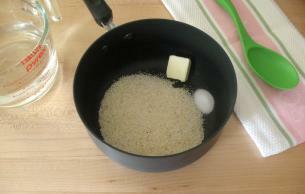 To make two servings of grits, measure out 1/2 cup of grits…. 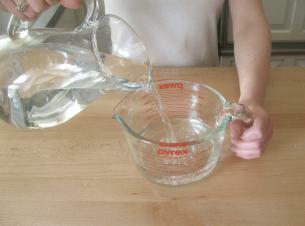 …and 2 and 1/4 cups of water. 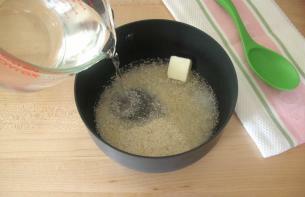 Measure out one Tablespoon of butter and 1/2 teaspoon of salt. 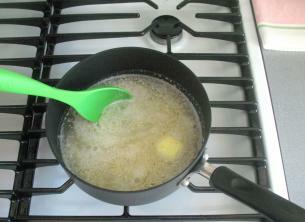 Put the grits, butter and salt in a sauce pan and add the water. Set the stove to high and bring the grits to a boil. 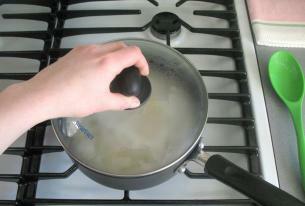 Cover the pot and lower the temperature to simmer. 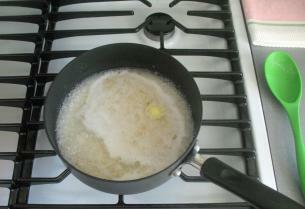 Simmer the grits until all the water is absorbed and the grits develop a smooth and creamy texture – about 40-45 minutes. 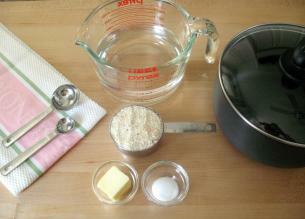 There are numerous variations to this basic recipe. Perhaps Fiona (or any of you who wish to join in) will share some with us. Yes, I remember “My Cousin VInnie”. Excellent flick, I thought Grits are a curious thing, though. They’re nutritionally almost empty. Flavor-wise, they’re not much to write home about, either. If it weren’t for the butter and salt, I don’t know how much of them would ever get eaten. I suspect they’re popular because they’re inexpensive and filling. 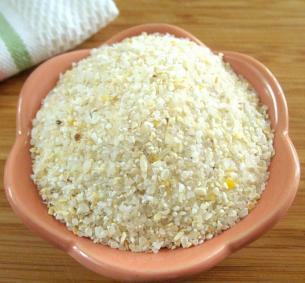 But, anything that marries up with corn or cornbread would work well with grits as a side dish or a garnish. I absolutely LOVE grits! A little bit of butter and a little bit of brown sugar or syrup and theyre absolutely amazing! Since I had a big bag of grits in the Pantry, I decided to make with cheddar cheese. My oh my oh my…they were tasty! YUM! I love grits! Alas, I have only made them from the box. But I still love them! Your book sounds like great fun! 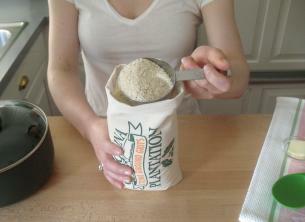 I too found that the grits recipe on the bag was way too salty for me. I was recently in South Carolina and LOVED the shrimp and grits at Soby’s in Greenville. You rarely, if ever find grits on a menu here in Boston! add bacon, eggs, and sausage for more southern and i my opinion, tastier grits.